TWO YEARS. Two years of finding myself. Two years of being pushed out of my comfort zone. Two years of going to places I never imagined I would. Two years of being anxious, nervous, scared, but happier than ever. Two years of meeting some of the coolest people (Shout out to Ben freakin’ Gibbard. Thanks for being so nice!). Two years of instafriendships. Two years worth of photos flooding my Instagram account, making me look way cooler than I actually am. Two years of making homes in hotel rooms. Two years of living out of my suitcase. Two years of not knowing where I’ll be tomorrow. Two years of waking up at 3am with a two hour call out for that first flight out to LA, smiling so much whilst greeting passengers that it’s made me a much happier “morning” person. Two years of a lot of coffee. Two years of feeling so freaking proud of be a part of something big. I’m writing this the night before my second ever recurrent training, giving me my “license” to be a flight attendant for another year. To be honest with you, I’m feeling anxious. It feels like the night before the first day of school. I won’t know most of the people in the classroom and although I am excited to make new friends and see some of my lovely classmates again, I’m nervous!!! I was driving home from the gym earlier, shouting my emergency evacuation commands to myself to better prepare for the 8 hour day tomorrow. I’m trying hard to shake off these nerves. The funny thing is, I feel pretty dang confident. I am not worried about my exam. I am so passionate about my job and I think most people who know me will tell you that. I guess it’s just the nerves you get the night before a presentation at school. My inner introvert is like, “noooo!” But I know it’s going to be so good. It’ll be so great to have something to be proud of. Challenge accepted. It’s crazy to think that just two years ago, I was heading into this completely blind and unaware of how much of my life was going to change. I remember asking HR if it was possible to change careers within the company if maybe two years in, I change my mind on flying and want to dabble in something else. As much as I appreciate the kind and thoughtful response to my question and I will forever keep an open mind to other opportunities, I am so grateful I found my niche. I’m that girl that is so cheerful at 3am because of my job. So cheerful, in fact, that someone once told me to tone it down. I tried not to take it personally and walked away, and I knew that the other 164 passengers appreciated a warm welcome at smile even though it was stupid o’clock. For awhile, I’ve been meaning to make a post about this job, to encourage those of you who are curious to give it a shot. Or maybe you have a friend who’s asked about it and you’re not sure what to say. 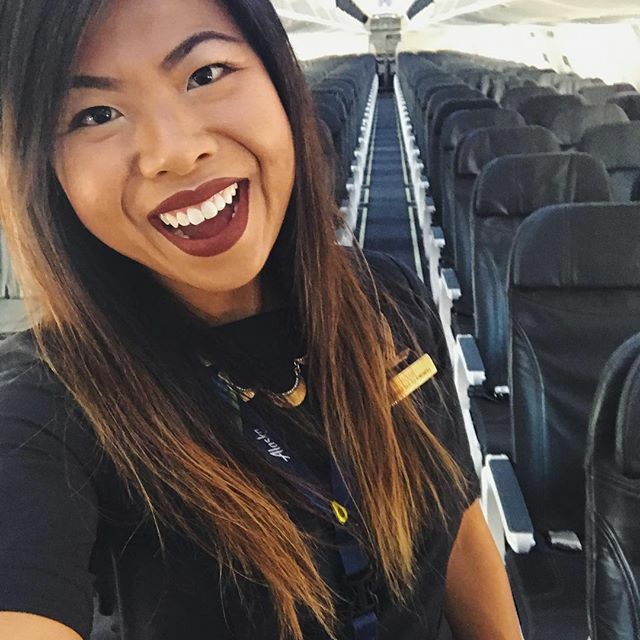 Here are some reasons I think being a flight attendant is fly (hahaha!) and you should give it a try. You’ll always have a pair of to tights or pantyhose handy. And a comfy pair of black pumps! You could live anywhere in the world. ANYWHERE! This is just some of MANY reasons why this job is so epic. If you ever have any questions or want me to elaborate on any of these, please feel free to reach out to me! Share this post, spread the word. Airlines are always hiring. *Pro tip: do your research before you apply! Every company is a little different. Find one that stands out to you, whose core values are also important to you. *Pro tip 2: NEVER. GIVE. UP. If it doesn’t work out the first time around, give it some time and give it another try! Timing is everything and it might not have been your time, but being persistence is key. For now, stay curious (and act on it). Sending lots of love and good vibes your way.